a) All entries must be submitted in person, by the entrant, before 5:30 p.m. on Friday, March 29. Entry registration will be at the Crystal Brush booth located within the Vendor Hall. b) An AdeptiCon Weekend Badge is required to submit entries. A badge may be purchased here. d) There is a limit of 1 entry per entrant, per category. e) Entrants are responsible for the transportation of entries to and from the competition. No storage space for transportation materials will be provided. Entrants must pick up entries on Sunday, March 31, at the times designated at registration. f) Only one person may be listed and credited as the entrant on any joint effort entries. While painters may work on original sculpts or conversions by other artists, and more than one artist may contribute to an entry if desired, there will be no co-credit given or division or duplication of prizes. 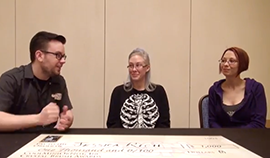 h) Entrants agree to provide all entries, at their own risk, to CMON, Inc. and AdeptiCon for the duration of the competition for the purpose of display, photography, and judging. 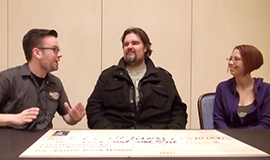 CMON, Inc. and AdeptiCon accept no responsibility for damage to or loss of entries during the competition. i) Entrants agree to have their entries photographed, videoed, or otherwise recorded by CMON, Inc. and/or AdeptiCon, and such recordings shall be the property of CMON, Inc. and/or AdeptiCon and shall be used in whatever manner CMoN, Inc. and/or AdeptiCon sees fit without further reference or payment to the entrant. a) Each category shall have a Gold, Silver, and Bronze Crystal Brush trophy. b) The Gold winner in each category will receive a cash prize of $200 in addition to the award. The Silver winner will receive $100 and the Bronze winner $50. There will be no cash prizes for the Young Talent category. b) The top 3 scoring entries overall, across all categories, shall receive cash prizes of $10,000, $2,000 and $1,000 respectively, guaranteed by CMoN, Inc. Each entrant is only eligible for one top 3 position, i.e. it is not possible to win any combination of the first, second and third prizes, the next runner-up will be awarded instead. c) For secondary categories created by Crystal Brush sponsors, any additional prize support will be arranged for by the individual sponsors. 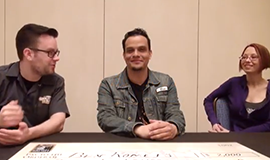 d) In the event of any dispute, the sum total liability of CMON, Inc. to any entrant shall be whatever the entrant paid to CMON, Inc. directly related to entry in the Crystal Brush 2019 competition, i.e. $0. All rules subject to change without notice. 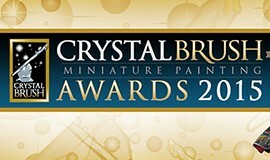 a) The Crystal Brush 2019 competition includes seven regular categories and a category for entrants 14 and younger. These are described fully on the Standard Categories page. Please note any specifications on height, base size, number of figures, etc. for your category. b) All units not mounted on a single display base must be presented on a movement tray. This is to facilitate handling and photography, and to ensure the group is arranged as the entrant intends. Movement trays are not required to be painted or have groundwork. They will not be considered in onsite judging, and will neither add to nor detract from the entry’s score. c) It is recommended that loose models on a plinth or movement tray be secured with putty, magnets, or other means of attachment. Please notify staff of any models which require special handling during registration. e) The number of photographs shown for each entry during online voting will depend on its category. Single Figure, Bust, and Young Talent will be represented by three photos—front, back, and an angle or detail shot. Unit, Vehicle/Monster, and Large Scale will be represented by three or four photos, according to size, complexity, and the discretion of the judges. Dioramas will be represented by four or five photos, according to size, complexity, and the discretion of the judges. Display plinths and any portion of the entry which falls outside of size restrictions will not be represented in detail in the photography. f) Entries may not be removed from the display cabinets during the competition for use in games. g) The head judge will have final say on what models are suitable for submission and category placement of submitted models. CMON, Inc. reserves the right to refuse any entry upon any grounds, at its discretion.